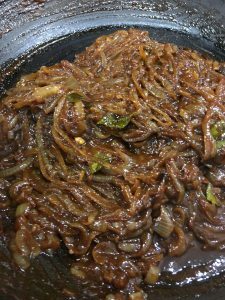 The Sri Lankan version of caramelized onions is sweet, spicy, and tangy. 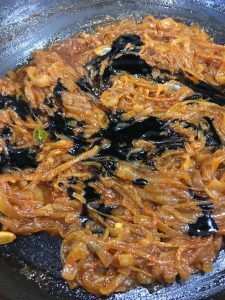 It’s important to cook the onions slowly—all the liquid in the onion must evaporate if you want the sambol to keep well. 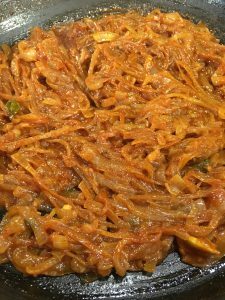 Made properly, this dish can keep for several weeks in the fridge, so you can enjoy a little with each curry meal for quite a long time. An essential accompaniment for hoppers, and delicious with many other meals. 1. 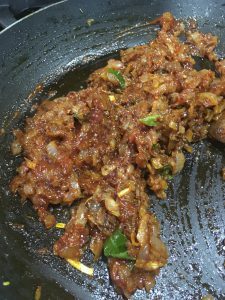 Heat oil in a large frying pan and start sautéing onions on medium-low (with Maldive fish, if using). 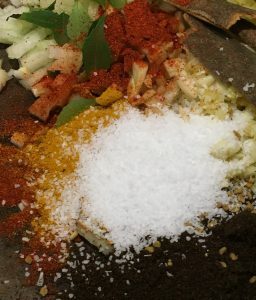 Add cinnamon, cloves, cardamom, curry leaves, and chill powder; continue cooking, stirring occasionally, until soft and transparent, about 30 minutes. 2. After about 30 minutes, cover pan, and simmer 10 minutes. 3. 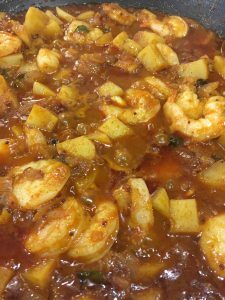 Uncover pan and continue simmering, stirring occasionally, until liquid evaporates and oil starts to separate from other ingredients. Season to taste with salt. 4. Remove from heat, stir in sugar and tamarind pulp and allow to cool before putting in a clean dry jar. Use in small quantities. If I had to pick the perfect Sri Lankan meal, this would be it. 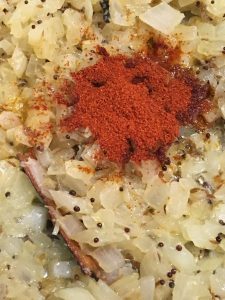 There’s nothing like breaking off a crisp piece of hopper, dipping it into broken egg, and scooping up some curry and a bit of seeni sambol. Delectable. 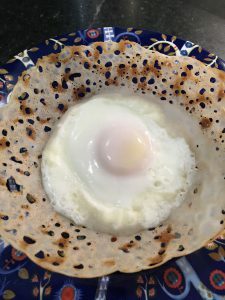 These rice flour pancakes have a unique shape; fermented batter is swirled in a special small hemispherical pan, so you end up with a soft, spongy center, and lacey, crispy sides — that contrast is the true glory of the hopper. Typically you’d make one egg hopper per person, plus another plain hopper or two, and maybe a sweet hopper to finish up. If you don’t have a hopper pan, you can make hoppers in a regular frying pan; you just won’t get quite as much of the crispy sides. It’s a little time-consuming to make hoppers, since each one must be individually steamed for a few minutes, but with practice, you can have four hopper pans going on a stove at once. I’d recommend starting with just one pan at a time, though! 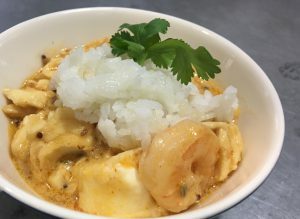 Serve with curry and seeni sambol. 2. Mix again, adding water if necessary to make a quite thin, pourable batter. 3. Heat pan (grease if not non-stick) on medium, and when it’s hot, pour about 1/3 cup batter into the center. Pick up the pan immediately and swirl the batter around, coating the cooking surface. The sides of the hopper should end up with holes in them: thin, lacy, and crisp – if the batter is coating the pan more thickly, mix in some hot water to thin it down. Cover and let cook for 2-4 minutes — you’ll know it’s ready when the sides have started to brown and the center is thoroughly cooked. A silicone spatula will help with getting the hopper out of the pan. 4. 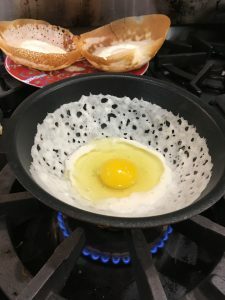 For egg hoppers, after swirling, crack an egg in the center before covering. The egg will cook as the hopper does, finishing in about 3-4 minutes. 5. 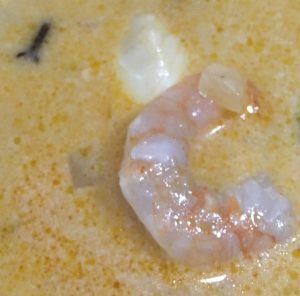 For sweet hoppers, after swirling, add a tablespoon of coconut milk and a teaspoon of jaggery to the center of the pan, then cook as usual. 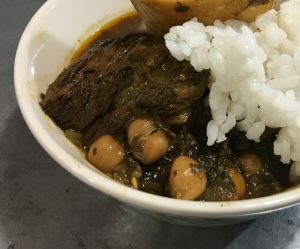 This is very similar to a traditional British beef stew, but the Sri Lankan version adds vinegar and peppercorns for a distinctly different flavor. I love to chew on the peppercorns for a bit of sharp bite, and will sometimes add even more peppercorns to the pot. 1. 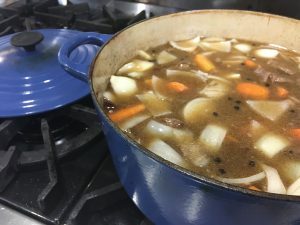 In a large stew pan, heat the oil on high, add the meat and brown on all sides (avoid crowding the pan, as that will cause it to steam instead of browning—do the meat in two batches if necessary). 2. 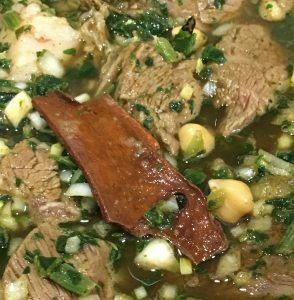 When nicely browned, pour in beef stock and a sufficient quantity of the water to cover the meat. Add the cinnamon, cloves, peppercorns, salt, and vinegar. Bring to a boil, then cover, turn down heat to low, and let simmer for 30 minutes. 3. Add the vegetables, turn the heat to high long enough for the stew to come to boil, then turn it back down to low and continue to cook, uncovered, until the meat is tender and the vegetables are cooked through, about an hour. You’re aiming for the sauce being reduced to a thick gravy, so add water or cook the liquid off as needed. Serve hot, with hearty white bread or rice. For take two, I figured I would coax them into it. I’d use flavors I knew they liked (chicken broth and Parmesan), I’d add in Italian sausage, and I’d cut the amount of beans in half, so they’d be a little less overwhelming. Success was…mixed. I thought it was delicious, though the peas were perhaps a little too similar in texture to the beans. (Should’ve stuck with my original plan to serve this with broccolini, but I forgot to pick some up at the store, oops.) Anand ate his entire plate and had seconds, hooray! Kavya, sadly, avoided both beans and peas (she did have two bites of each, to show willing, but that was all I could talk her into), ate lots of sausage, and said that even her beloved pasta tasted strange to her. Ah well. I’ll probably try making this or something like it a few more times and hope that she gets more accustomed to the flavors. 1. Sauté onion in olive oil on medium-high, stirring, until softened. Add garlic and continue sautéing until onions are golden-translucent. 2. Turn heat to high, add Italian sausage and break up, stirring, into small chunks, letting sausage brown a little. 3. After a few minutes, add white wine to deglaze the pan, scraping up any browned bits. Add chicken broth and beans, stirring to combine. Add Parmesan and crushed red pepper. Simmer on medium until sausage is cooked through, 5-10 more minutes. By that point, the liquid should have reduced to a nice thick sauce. 4. 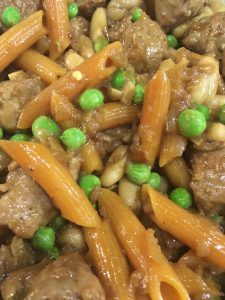 Stir in pasta and frozen peas and cook a few minutes more, until well combined. 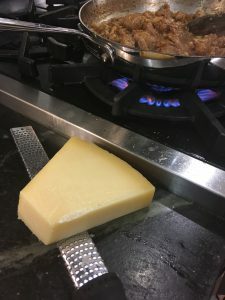 Serve hot, passing additional Parmesan for grating. I had a busy work day yesterday, so it was six o’clock before I had a chance to look at the calendar and remind myself what the evening plans were — only to be reminded that I’d planned to go to a refugee-supporting potluck, which started at six o’clock! We were supposed to bring something to share from countries that might be affected by a refugee ban, so I obviously wanted to bring Sri Lankan food. But I needed something I could make fast! 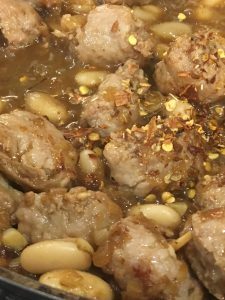 I also ideally wanted to bring a savory dish, and something with protein, because potlucks tend to lean heavy towards the sweets and the starches. I poked around in the freezer and pantry, confirmed I had frozen shrimp and russet potatoes; that meant I had a plan in place. 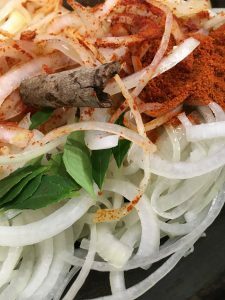 By 6:30, I was transferring the curry into a disposable container and heading out the door; just a few minutes later, people were tucking into the food enthusiastically. Yum. 1. Put potato cubes in a microwave-safe bowl with water to cover and microwave 5 minutes to par-boil. Let sit until needed. 2. 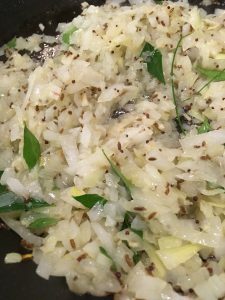 While potatoes are microwaving, sauté onions in oil or ghee with ginger-garlic paste, mustard seed, cumin seed, and curry leaves, stirring on high, until onions are golden-translucent, about 5 minutes. 3. Stir in chili powder, curry powder, ketchup, and salt. Stir a minute or two to blend. 4. Add potatoes with their cooking water. Add shrimp (still frozen is fine). 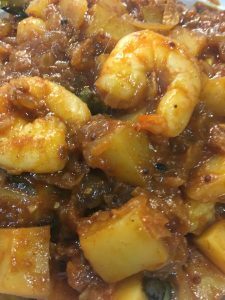 Continue cooking on high, stirring occasionally, until shrimp are cooked and pink, and potatoes are soft. 5. Add lime juice, give a final stir or two, and serve hot with rice or bread. 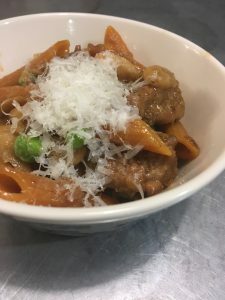 recipes to a thousand strangers? I suspect I will just have to keep making the curry, and keep having him taste it, until Anand is actually accustomed to it. I should have undoubtedly started this process years and years ago, but better late than never, I suppose. 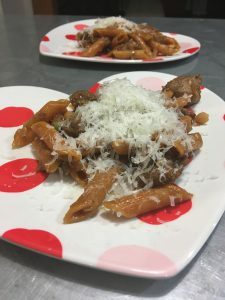 One of our goals for this year is to actually get the whole family eating the same dinner more often, which should, in the long run, make our lives a lot easier. One thing worth noting in these photos is the color change from the second to third photo. 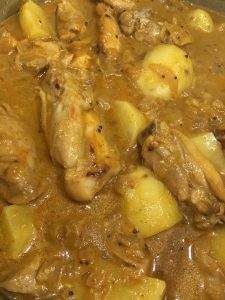 A key to a good chicken curry is having a tasty kulambu (or kuzhambu, depending on how you do the transliteration), which is basically the curry sauce or gravy. Some people make it more liquid, some more thick (if you use potatoes in this dish, they will thicken the sauce). 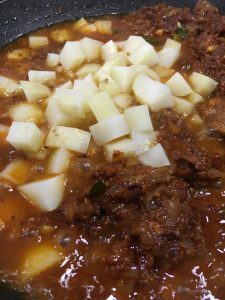 In this recipe you build a fairly spicy sauce, and then add whole milk partway through the cooking process, which melds the flavors and mellows the spice level, lending your curry a creamy richness. 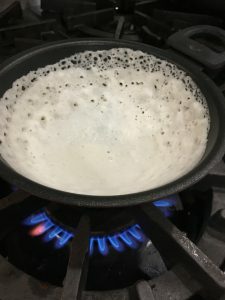 You can use other kinds of milk if you’d prefer, and in fact, coconut milk is often used in Sri Lanka, but coconut milk is a little rich for everyday cooking — my family tends to save it for special occasion meals. I’ve used goat milk (works fine) and soy milk (a little thin, but acceptable). Almond milk is quite thin, and has a distinct nutty flavor — it’s not bad, but it does take the curry in a different direction; if you can find cashew milk, that might be a better option. Note: If you’re using coconut milk, which is fairly sweet, you may want to switch out the ketchup for chopped fresh tomatoes + a little vinegar. My mother started using ketchup (which has sugar in it already) to compensate for the lack of sweetness in cow’s milk, when she first came to America as an immigrant in 1973, and coconuts and coconut milk were not so easy to come by. 1. In a large pot, sauté onions in oil on medium-high with mustard seed and cumin seed, cloves, cardamom pods, and cinnamon pieces, until onions are golden/translucent (not brown). Add chili powder and cook one minute. Immediately add curry powder, chicken, ketchup, and salt. 2. Lower heat to medium. Cover and cook, stirring periodically, until chicken is cooked through and sauce is thick, about 20 minutes. Add water if necessary to avoid scorching. Add potatoes if using, and add milk, to thicken and mellow spice level; stir until well blended. 3. Cook an additional 20 minutes, until potatoes are cooked through. Add lime juice; simmer a few additional minutes, stirring. Serve hot. 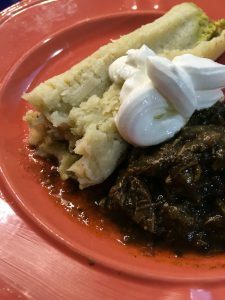 I was a little frustrated yesterday when I steamed a dozen frozen tamales (handmade by a local mom) for a potluck we were hosting, and discovered after steaming them that we were out of tomatillo sauce. I’d sworn we had at least half a bottle left in the fridge, but no, there was no tomatillo sauce to be had for love or money. I was craving that tangy flavor, and I knew that my tamales would be a little sad and dry without it. But then I had a flash of what I swear is brilliance — I had a little beef curry left, and it was also beautifully tangy. Could I possibly combine it with the tamales? 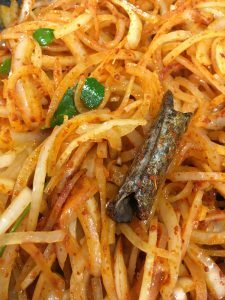 I’ve been reading a lot about Mediterranean cooking recently, and wondering if I could adapt some of our Sri Lankan flavors to that style of cooking. 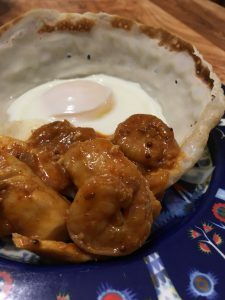 This dish started with Beef Smoore, a dish of Dutch / Sri Lankan origin, one of those recipes where you just dump everything in a pot and simmer it for hours. 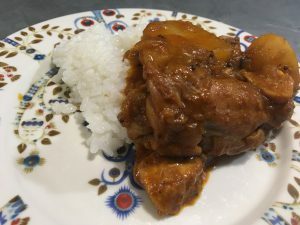 It’s heavily spiced, because if you use a more typical amount of spicing, the flavors tend to get quite mild after hours of cooking, and you end up with a result closer to beef stew than curry. The classic Smoore recipe is rich and delectable; great party food for a holiday or special occasion. But tonight I revisited the recipe, aiming for something my family might eat more often. I reduced the amount of beef — instead of 3 lbs. 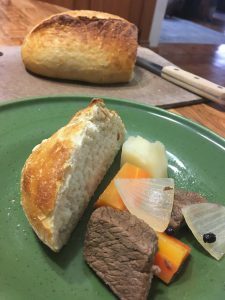 of beef roast, I used just one pound of beef chuck and one piece of beef shank. I added chickpeas and spinach, bringing fiber and more nutrients to the dish, and skipped the coconut milk altogether. This version is both more heart-healthy and budget-friendly, but without compromising flavor at all — the meatiness of the shank and its marrow pairs richly with the vinegar and tamarind. 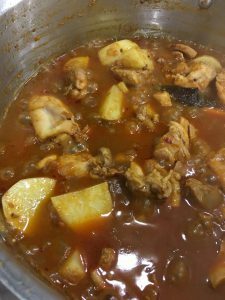 The end result is a tangy stew (or soup, if you prefer), delicious with a little rice or bread. I’m continuing my efforts to accommodate my daughter to Sri Lankan flavors, so this uses half the chili powder I would normally put in for myself. She loved it, and I like it just fine like this, but for a more Sri Lankan version, do double the chili powder! 1. 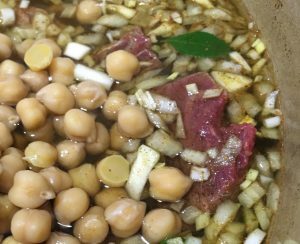 Heat the oil or ghee on high in a large, heavy pot, and sear the beef, stirring, until browned on all sides, which adds great depth of flavor to the sauce. 2. Keeping heat on high, add remaining ingredients to the pan and stir to combine, scraping up any browned meat on the bottom of the pan. 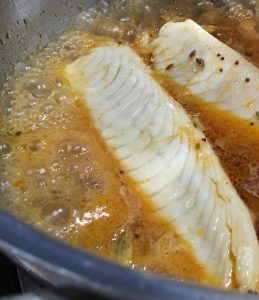 Bring to a boil, cover the pot, and simmer gently until meat is tender, approximately 2-3 hours. 3. Remove lid and stir; if the gravy is too thin for your desire, reduce it by boiling rapidly uncovered. Serve hot, with rice or bread.